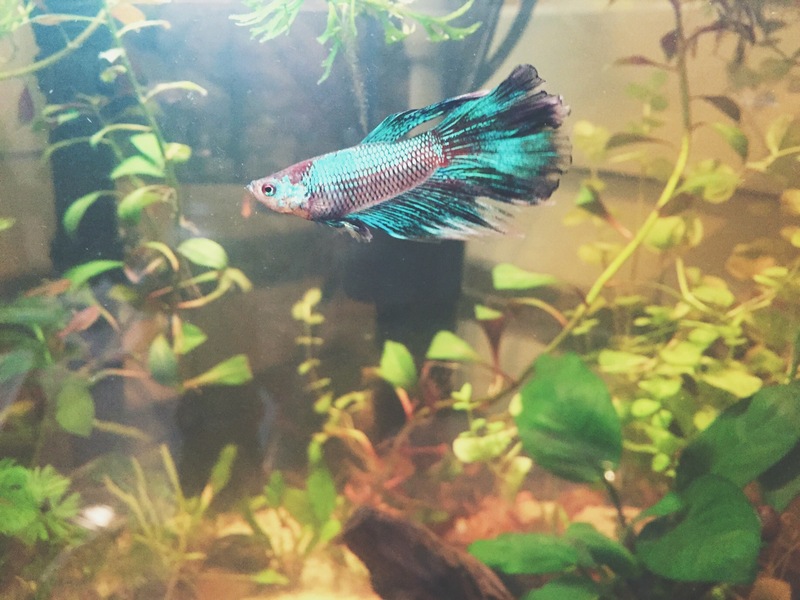 Finn was a sort of impulse find at petco. Saw him Friday, went back Sunday and he was still there so I had to get him. Elephant ear male. 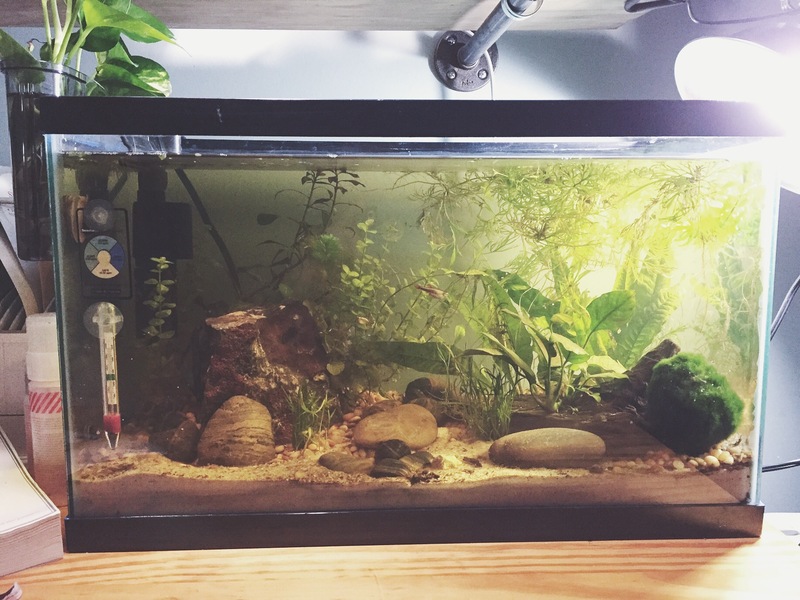 5.5 gallon set up that needs more plants! Azoo Palm filter and Hydor 25 watt heater en route from Drs foster and smith. 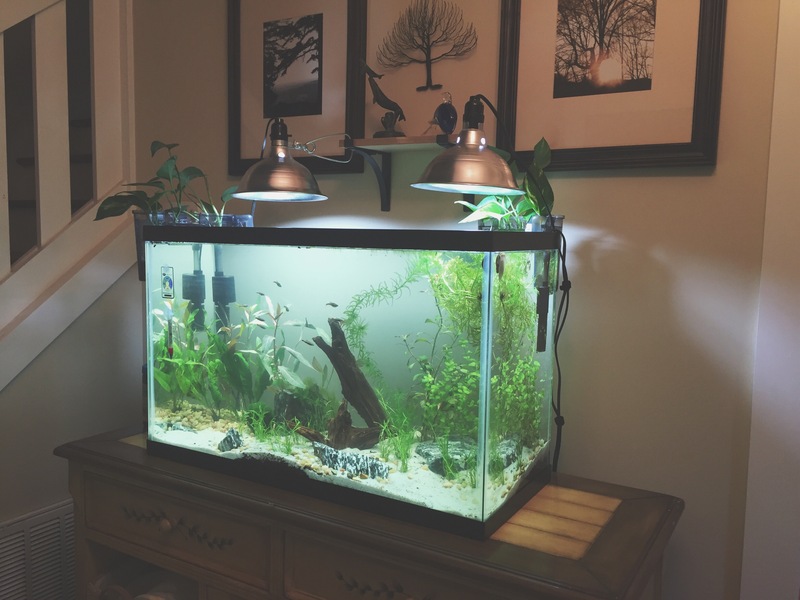 I’d already ordered them because the palm filter and heater were on sale, adding Seachem stability to cycle tank silently. 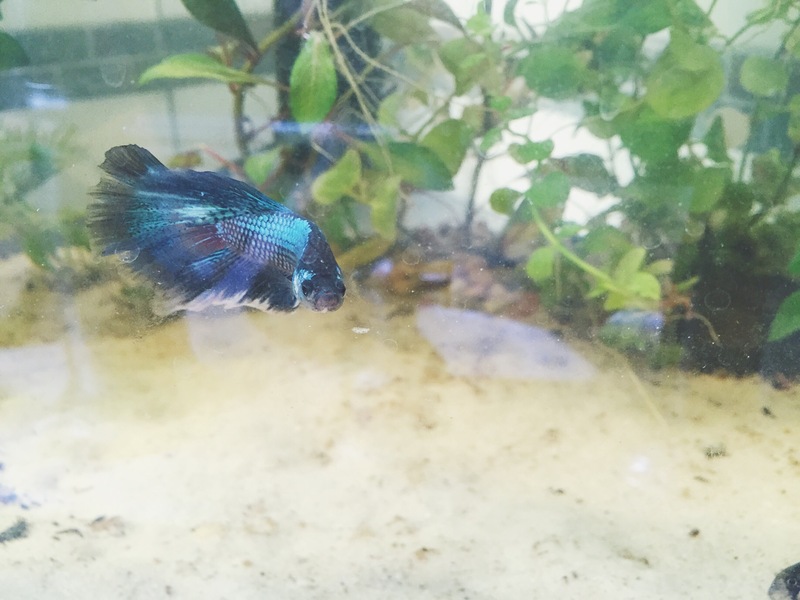 He’s still shy, I hope I’ll get better pics soon, I’m curious to see what his color will do over the next few weeks. 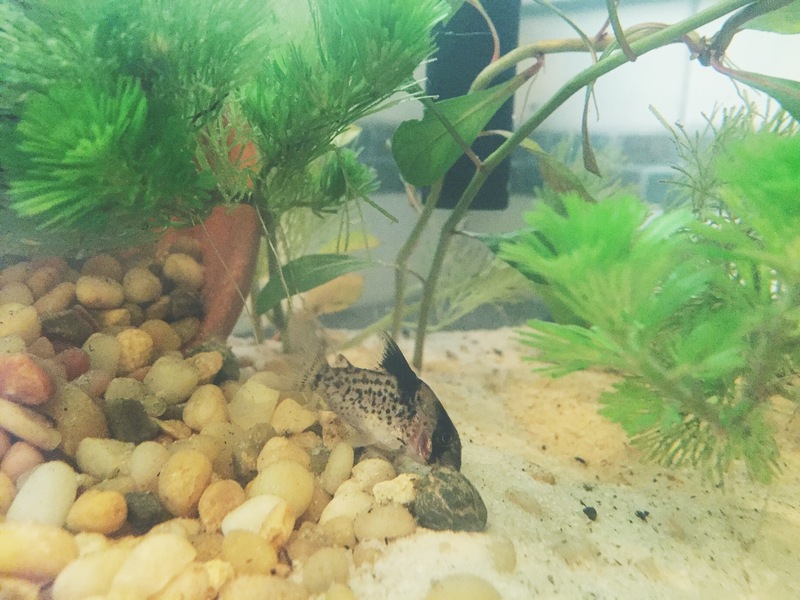 So adventures and misadventures of learning this hobby: one of the spotted corys (c. Melanistius) had to be euthanized on July 23rd. 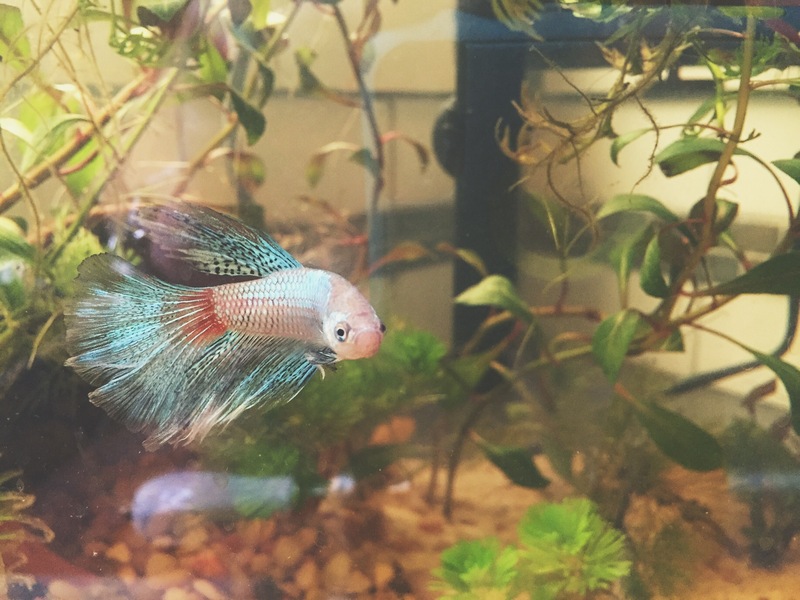 He was dying and we were leaving town for a week and I feared for the life of the rest of the tank if he died while we were gone. The female Cory went nuts after I took him out, I felt horrible. 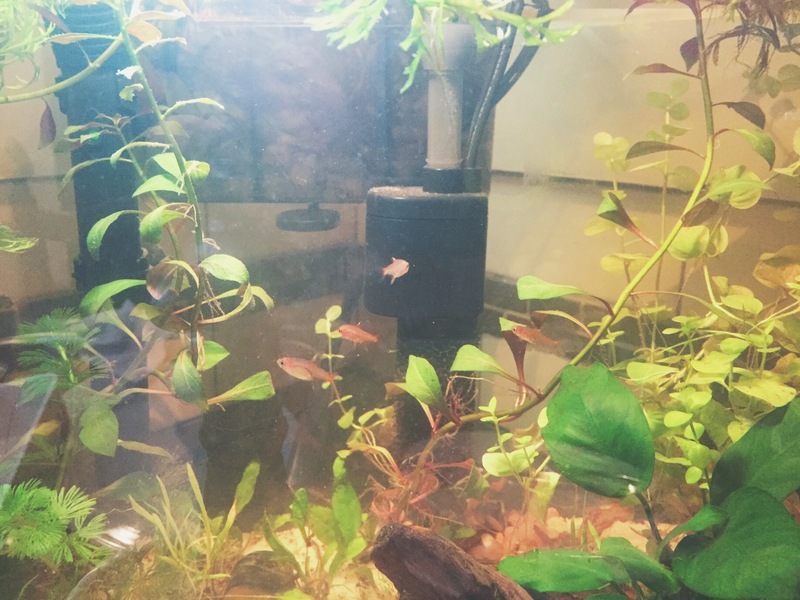 She survived despite the obvious stress and the first day we were back I ran down to my LFS to get more Cory cats (7/31). I already knew they only had c. Sterbai. I’d been waiting a month for more melanistius and they hadn’t gotten them. I figured some corys were better than no corys for her. I decided to get 4 based on the employee saying my tank wouldn’t be overstocked. Well, it felt overstocked. 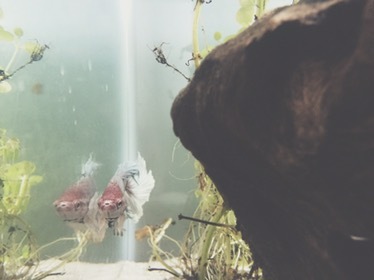 They were really hyper and glass surfing non-stop and they were bothering the betta. 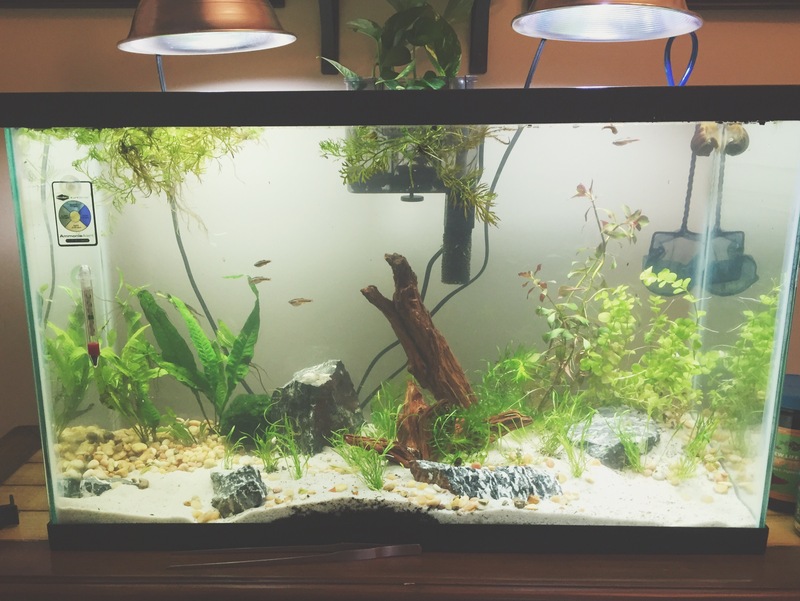 So I put a heater on my 29 to keep it at 72 and I transferred all five corys over on 8/4. They glass surfed like mad until yesterday, and now today they’ve been way less active. I trust their activity levels will even out now that they are used to the tank. 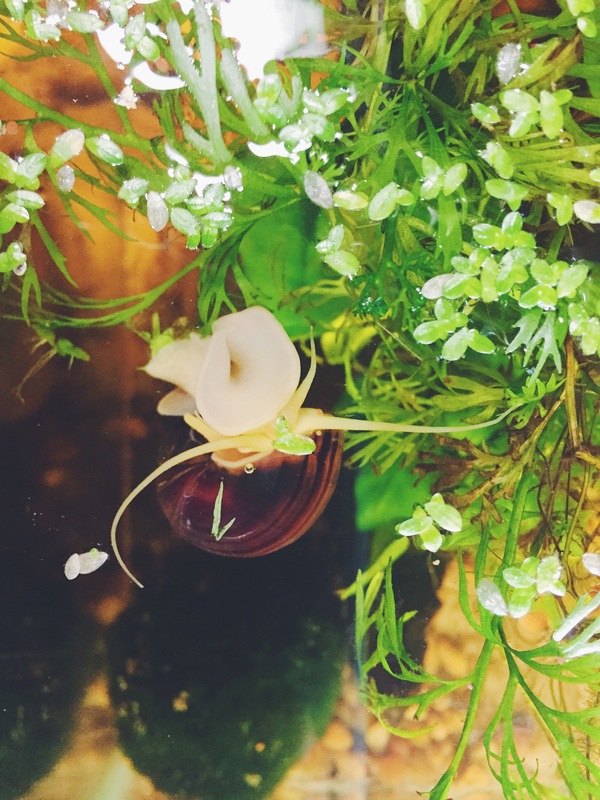 In other news, my house sitter overfed both tanks and the 29 wasn’t balanced enough to handle it so I got an algae and pond snail outbreak. Some in the 10 gal too, but that was easier to wrangle as its heavier planted by percentage. 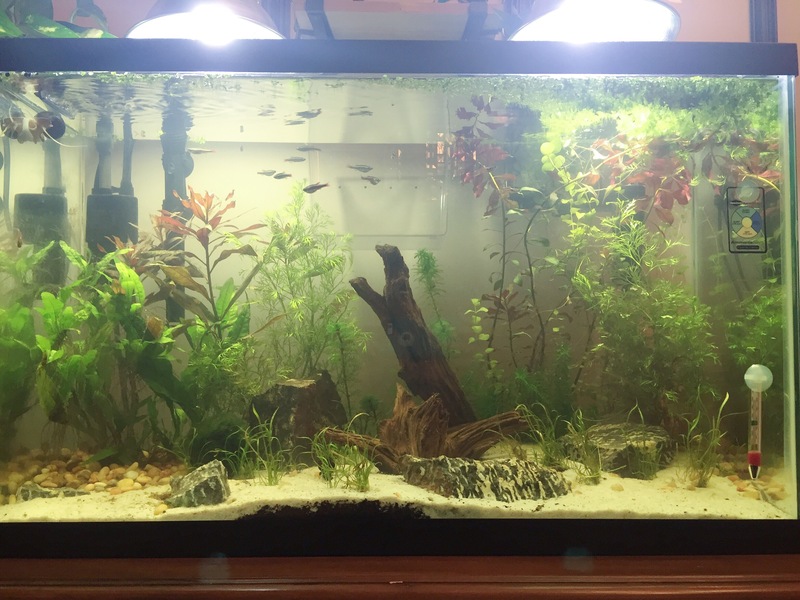 I’ve upped my water changes in the 29 to about 30% every other day. I’ll do my 3rd at that frequency tomorrow. But I’m seeing a huge difference already. 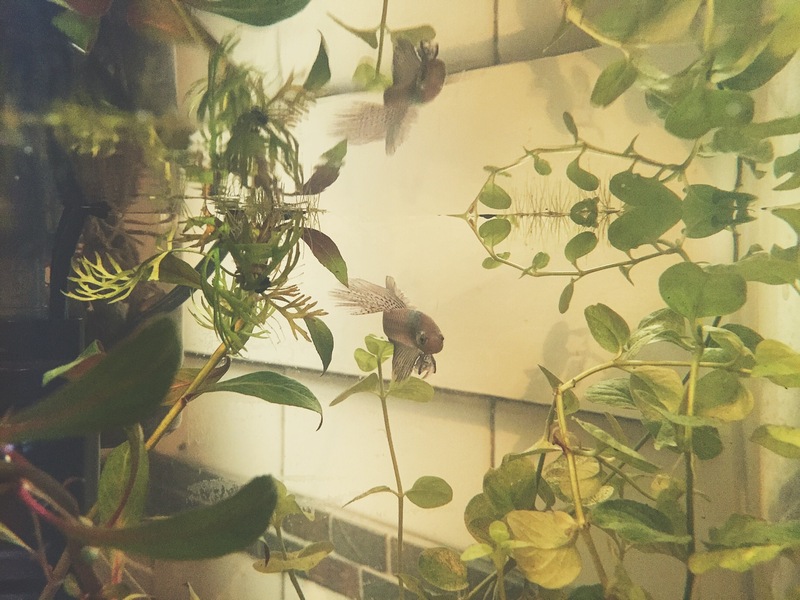 Today I got tired of the huge tangle of water Sprite in my one lower flow corner (it’s not dead but it’s slow enough for floating plants to get stuck), and I planted all of it. It was shading the Pygmy sword too much which needs more light as its all but died out in the 10 gallon. I love how it turned out! 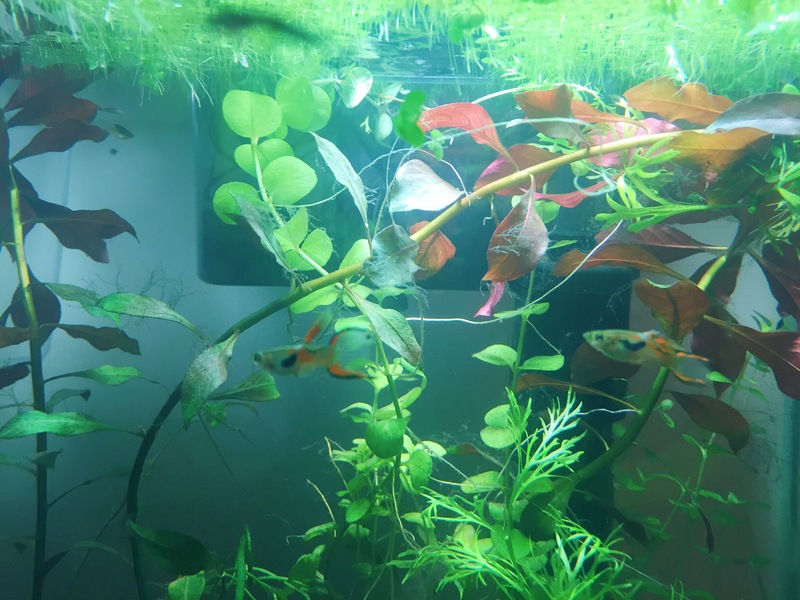 I think in a few days I’m going to prune the ludwigia repens and replant the tops to turn into new stems. In other news, the same day I bought the c. Sterbai I got 4 female (what they had in stock) celestial pearl danios and 4 male Endlers live bearers for the 29. I didn’t intend to stock that fast (by adding the corys later that week), so I’m waiting a few more weeks at least and then I think I’ll try to get some more red cherry shrimp. And then wait longer to get any more CPDs but I think I’ll try for 10 total, and at least 2 more Sterba’s. Also one of the minnows disappeared. I’m pretty sure it was my fry although he/she was approaching adult size and there is still one with a bluer stripe. 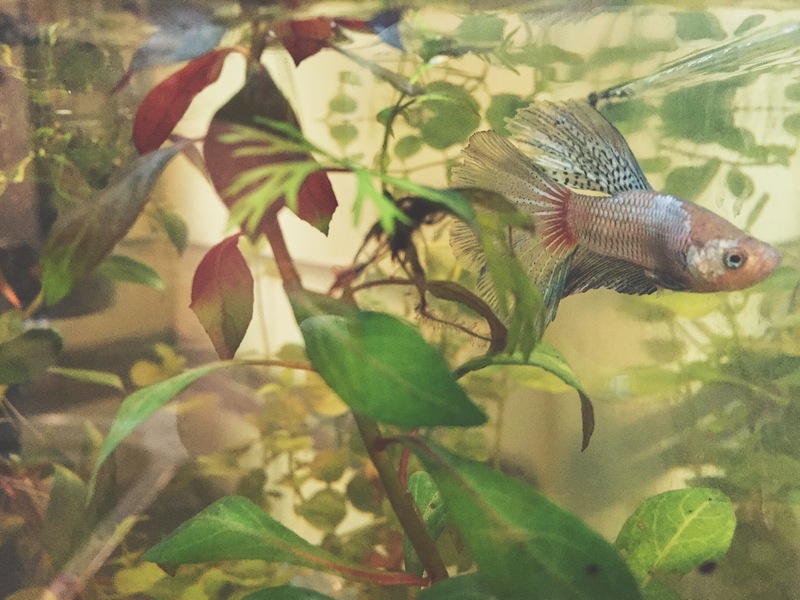 So the betta has been named “Sharptooth” by my son, thus breaking up my doctor who theme. But it is his fish so it’s all good. 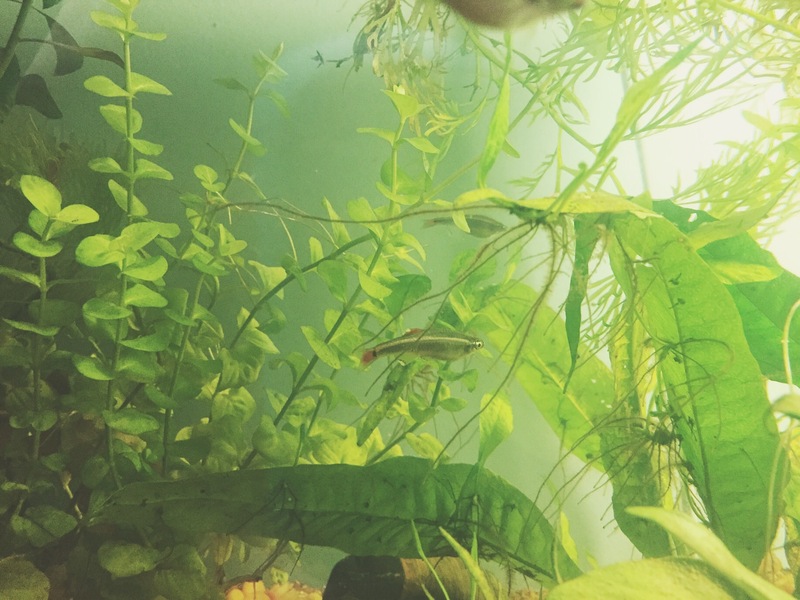 He also really wanted ember tetras, and since they stay so small, we added five, and I’ll still add 2-3 Cory cats (corydoras melanistius) when my fish store gets more in, hopefully next week. 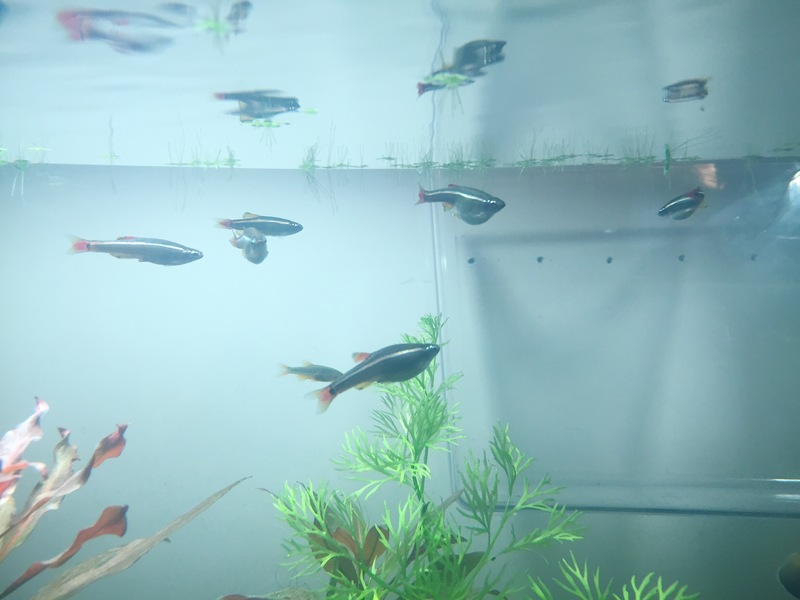 We could probably add 3-4 more ember tetras as well. 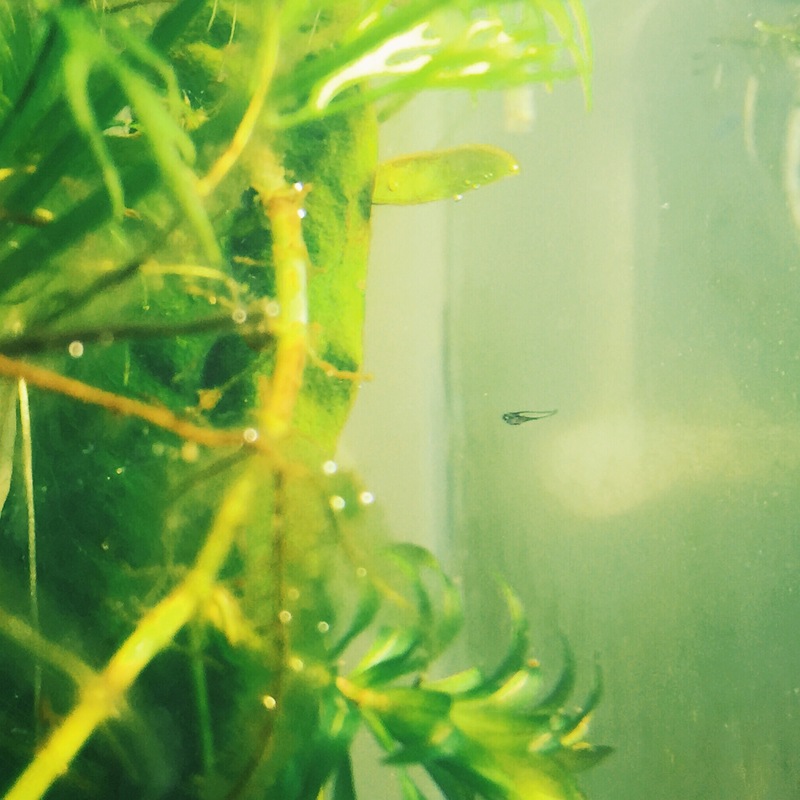 Also added three Amano shrimp to the cleaning crew. 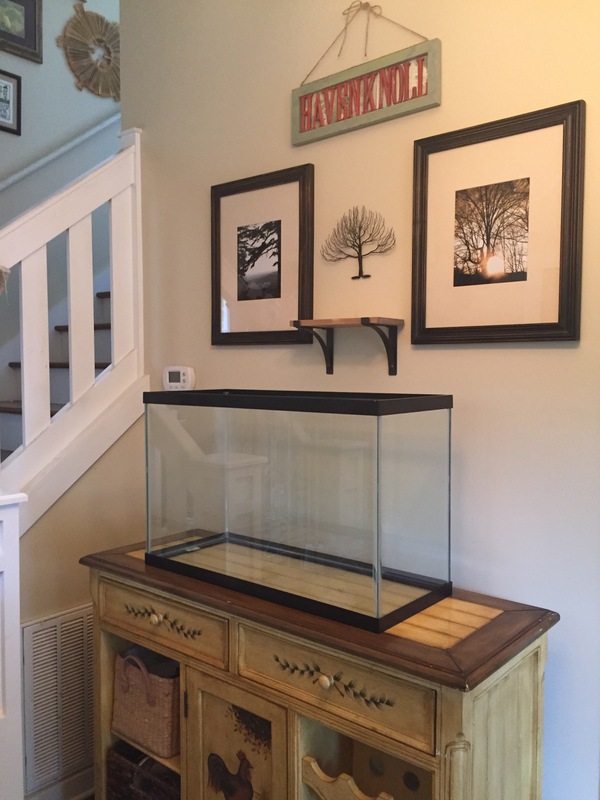 So once upon a time last Wednesday, my husband says to me, why don’t you get a bigger tank? And since the Petco dollar-per-gallon sale had just started, I was like, brilliant, okay! My local fish store, the Aquatic Critter, had driftwood mounted on slate tiles as well as zebra rock by the pound. So these formed my hard scape. I read the whole debate on sand under rocks versus rocks on glass and decided on sand under rocks. 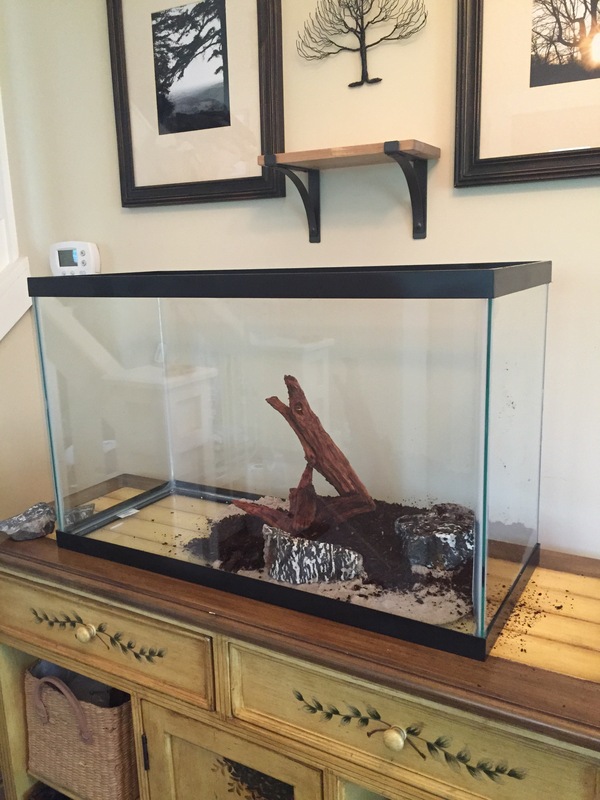 So I spread a thin layer of washed sand under the hard scape area. This is pre-washed all purpose sand from Lowes. I can’t find a link to this particular kind anywhere but it seems to work great. I filled a five-gallon paint bucket about a third of the way with sand and then washed it with a hose until the water was clear. That meant I didn’t have to change the water in the tank after I flooded it. Well worth it! I did not rinse my dirt (Miracle Gro organic potting mix), I just sifted through it with my fingers and pulled out the biggest pieces of wood and bark. 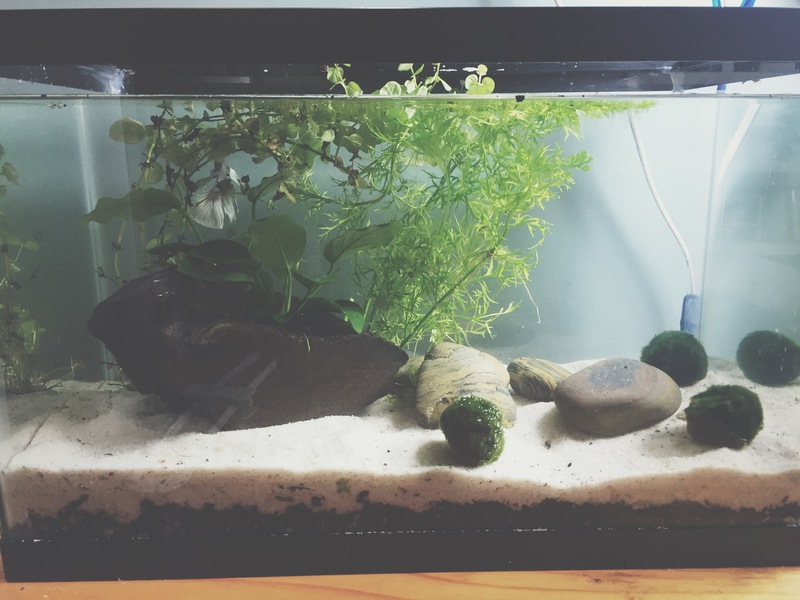 I did put dirt under the Java Ferns even tho they don’t have true roots because they seemed to benefit from it in the first tank. I put gravel as the cap in that section though so the roots can grow around something and it made it easier to keep the rhizome above the substrate. I ended up with a nice little slope up towards the back thanks to the zebra stones keeping things in place. It’s about 3 inches deep in the back (2 inches of soil plus one of sand). The front is about 1/2-3/4 inch of sand only in the front corners, with an inch of dirt capped by a half inch of sand in the middle. 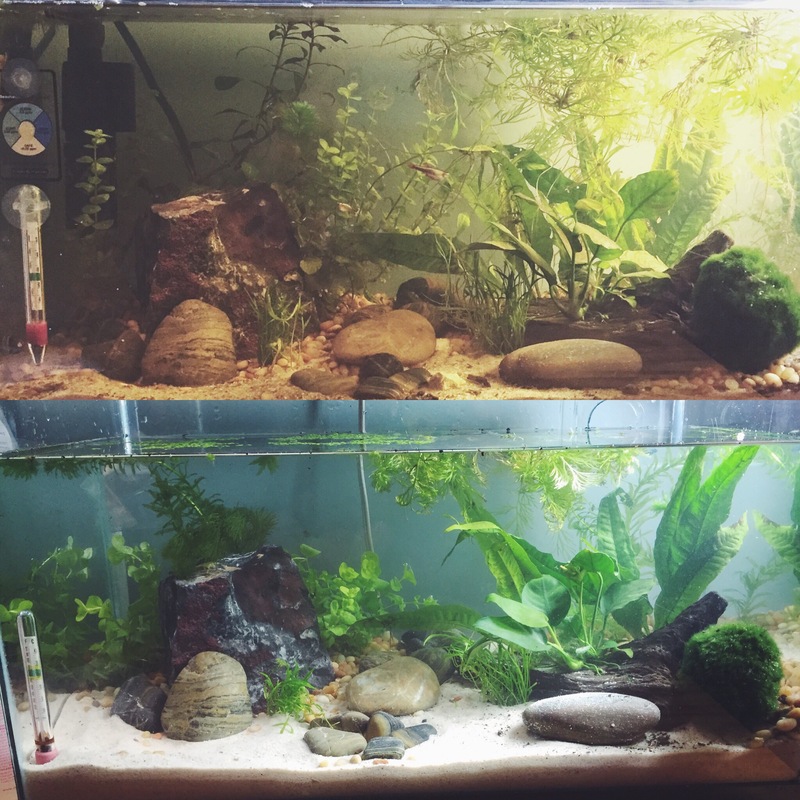 Also added a Marina s20 to the left side, together with the s10 from the original tank this provides enough filtration. 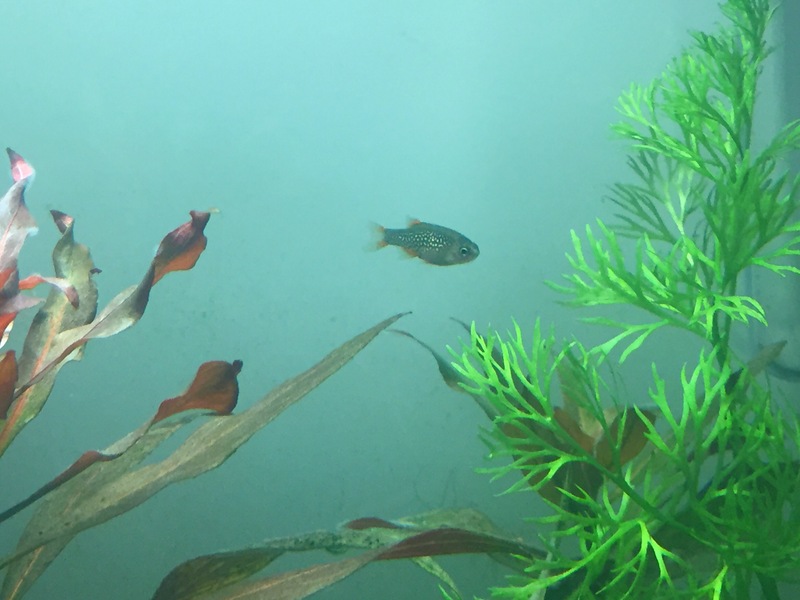 I put the bigger one on the side to create a stream across the surface of the tank since the minnows come from a stream environment in the wild, though since these are all tank raised, it might not matter but they seem to enjoy playing in the flow. Then yesterday I went back to the aquatic critter and added another version of ludwigia on the left, as well as 6 more minnows. Still to come: more cabomba behind the driftwood, 6 corydoras palaetus (peppered corys), and at least 6 more red cherry shrimp, with some males this time so I can have shrimplets hopefully. 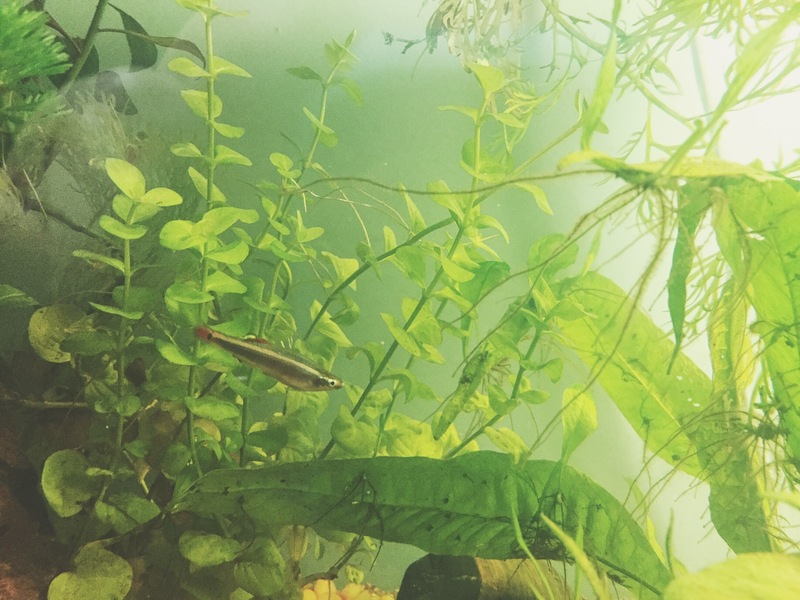 And if the minnows don’t start giving me more fry, I’ll eventually add more of them but I thought I’d give them the chance to have some more babies, lol. I’ll put up a complete equipment and plant list here soon. 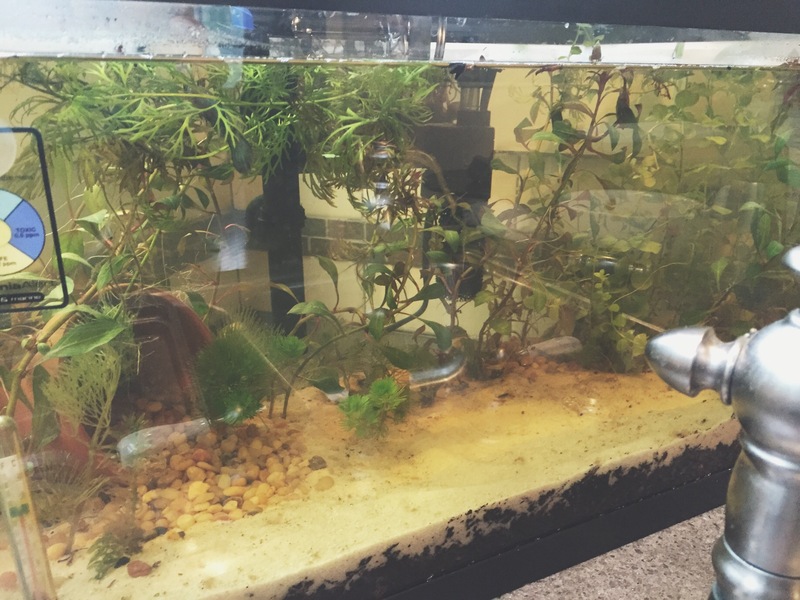 It’s been one month since I added the minnows to tank 1! Little gal or guy is growing up! And Twelve is super happy! He colored out spectacularly! Meet Twelve. Don’t tell my son. 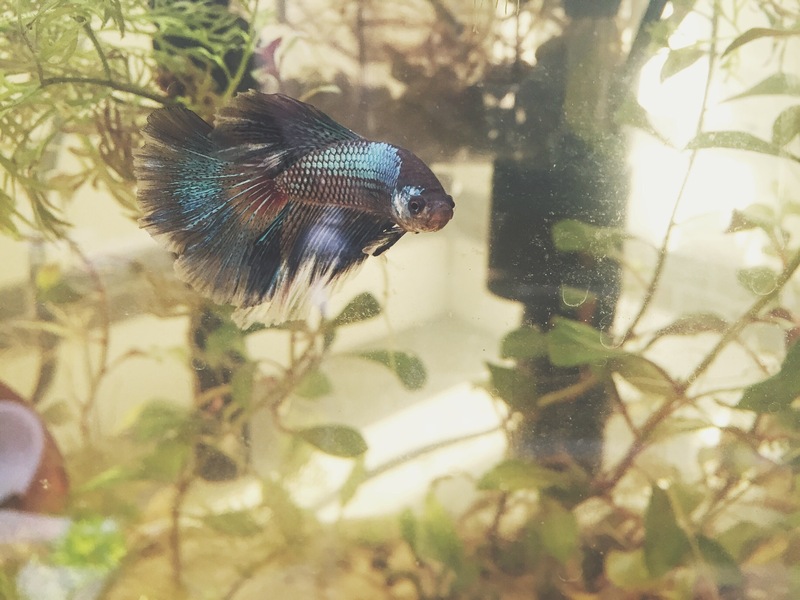 Technically the betta is his and he refuses to name it. I know, right? But as soon as I got a look at those eyebrows I know just who he needed to be named after. And yes, a Tardis tank ornament is coming in case you were wondering. 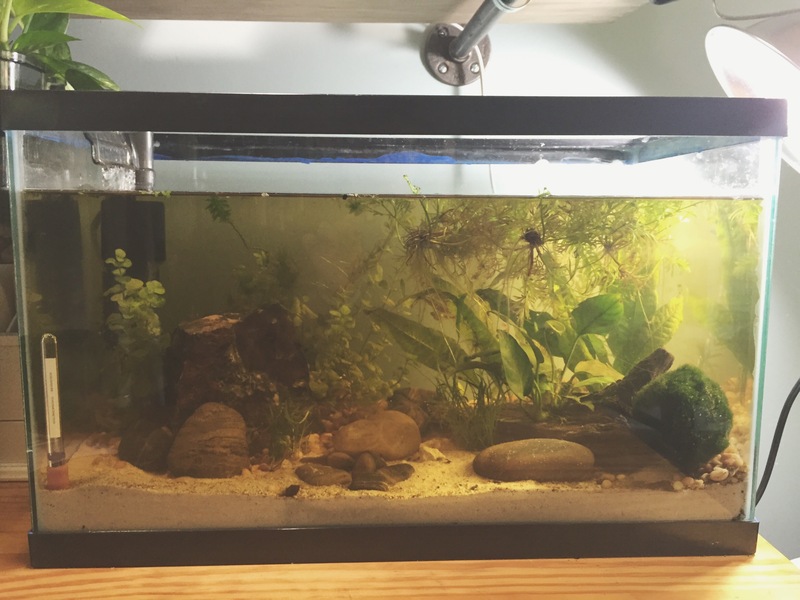 I added a bunch of stems of ludwigia to help with water quality too. I’ll probably remove some when the Java ferns get bigger. We’ll see. 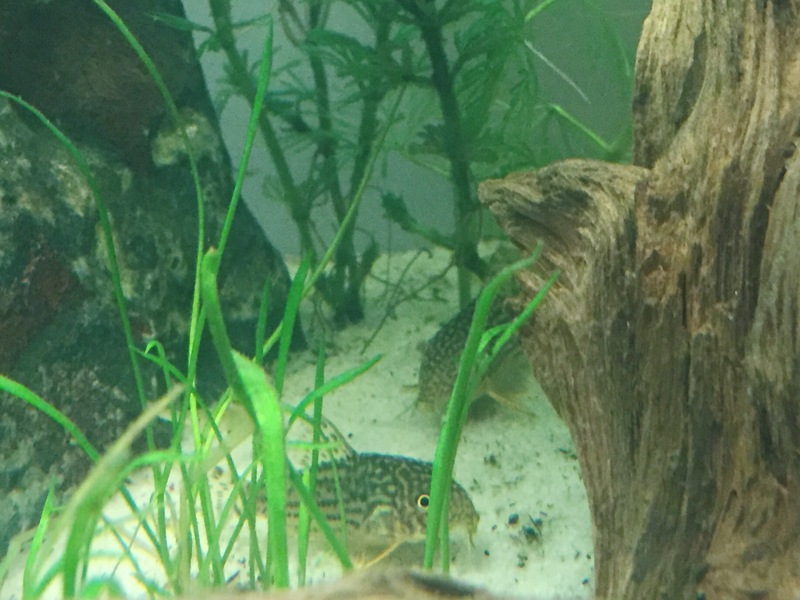 Twelve’s companions are Cory catfish: corydoras melanistius or spotted corys. I think it’s a male and female pair so they’re Amy and Rory. I’m having fun with this. In a few weeks or whenever my local fish store gets more, 2-3 more companions will be joining these three. 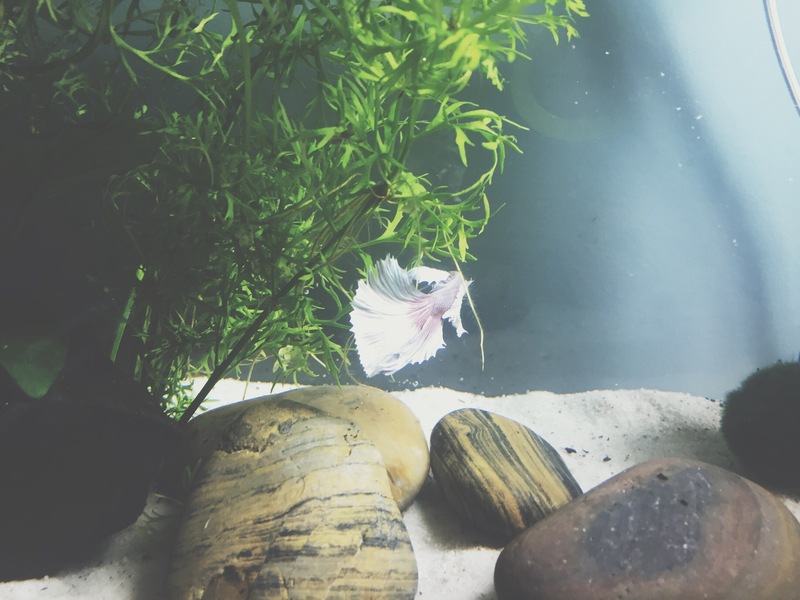 I’ve also moved the ghost shrimp in to see if Twelve is a hunter. If not, I’ll add some Amano shrimp later as well to act as clean-up crew. The clay pot was well rinsed, installed at an angle, and partially filled with aquarium gravel to completely block the drainage hole so Twelve won’t try to swim through and hurt himself. I had a nice piece of driftwood in here which stained the water a lovely weak tea color but I decided it was too rough for Twelve’s fins, so I took it out. I’ve got some Marimo moss balls and a manzanita wood in route this week so I can finish the layout before long. 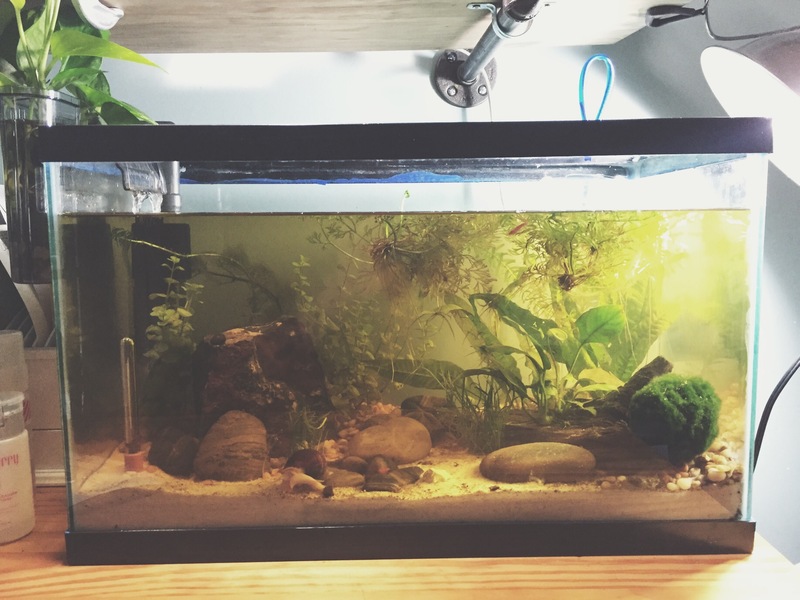 Might add some micro sword and/or rotala. Still ruminating. 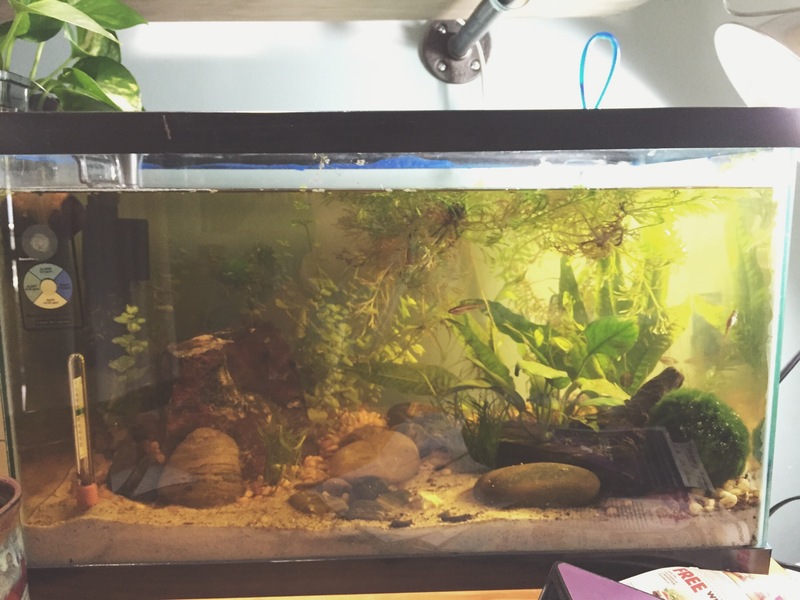 10 Gallon Walstad update: Using prime was definitely messing with the Ammonia reading on the API master test kit. Persistent reading of 0.25ppm. So I bought a Seachem Ammonia Alert. Good reviews. Lasts for a year, no need to do any testing. It’s stayed perfectly yellow, and has been in the tank since last Friday. 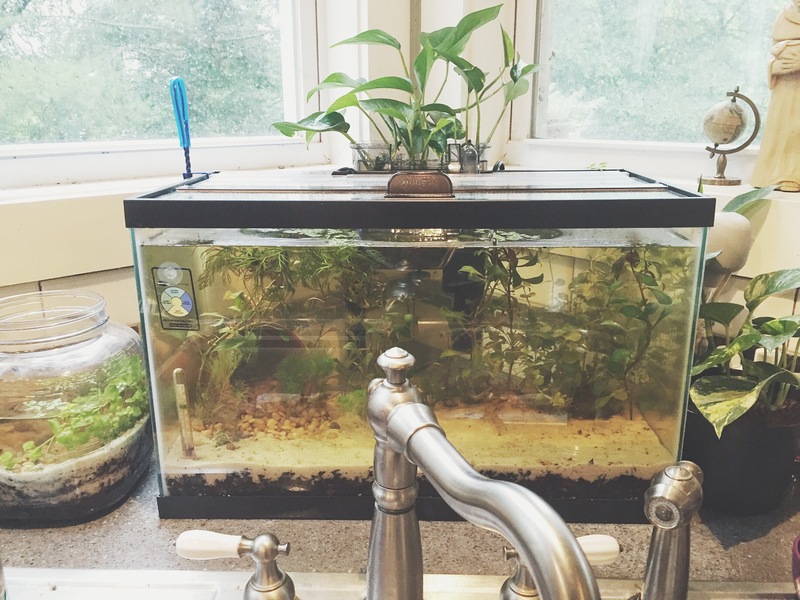 It says it can take a couple days to acclimate to the tank, but after that will respond to ammonia in 15 minutes. So I’ve got no ammonia, no nitrites and no nitrates (per the master test kit, but I don’t think the Prime could mess with those readings. Plants have gone nuts so I went out and bought a second ten gallon and planted all my cuttings and baby Java ferns from the first tank in it. No critters yet. Pretty sure my WCMM spawned earlier this week so we’ll see how many babies make it from that. I’ve got one healthy baby that’s about a half inch long now from the first round. I think the ghost shrimp culled the others, and then the second one just disappeared. 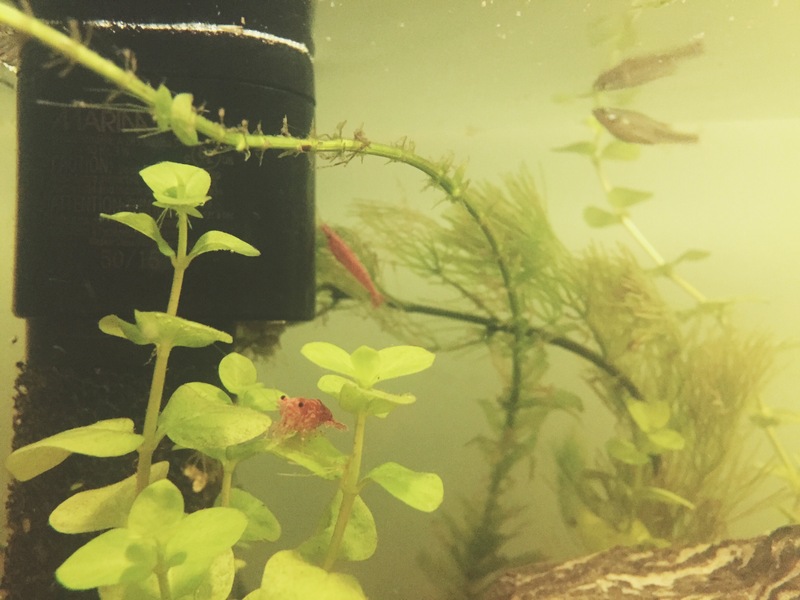 I also think there may only be 3 out of the 4 red cherry shrimp in that first tank now, but if one died, it basically vanished. Never caused an ammonia spike, guessing it either got eaten or else they’re doing a good job of hiding in rotation. I regularly see 2 or 3 at once. Something’s working right because my minnows had babies! I’ve seen 2 or maybe even 3 for sure, hanging out in the water sprite. I managed to get a picture and video of the biggest one! 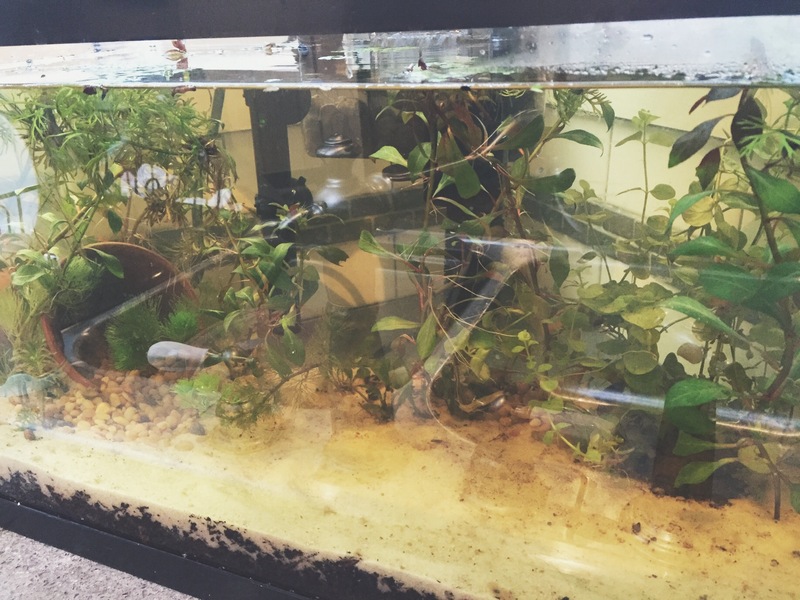 Also I’m seeing significant plant growth from the water sprit, the creeping Jenny, and the Anacharis in particular. I’ve planted a bunch of the Java fern’s babies too, so we’ll see how well they establish themselves. 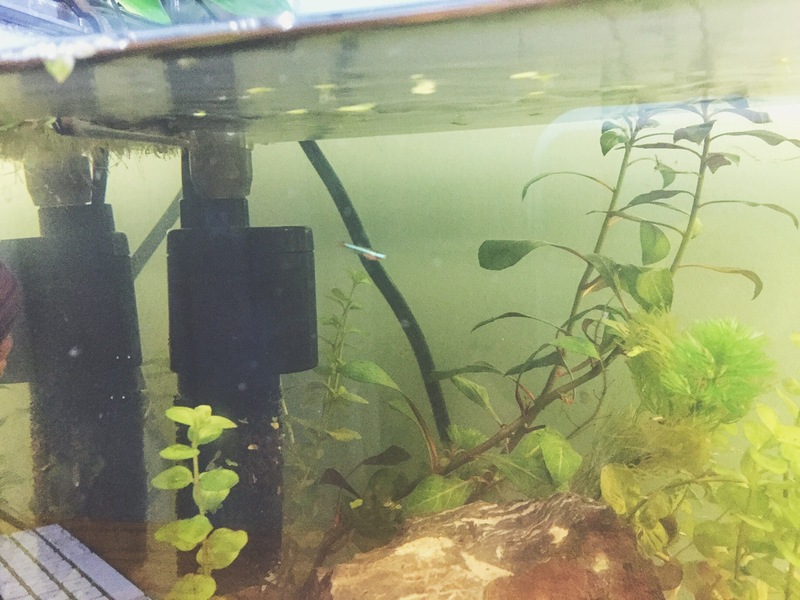 I’m down to just feeding fish, topping off water, and I did do a partial water change at one week this week, but now that I’ve got fry I may push it past a week. The plants are established enough I think going a little longer should be fine. 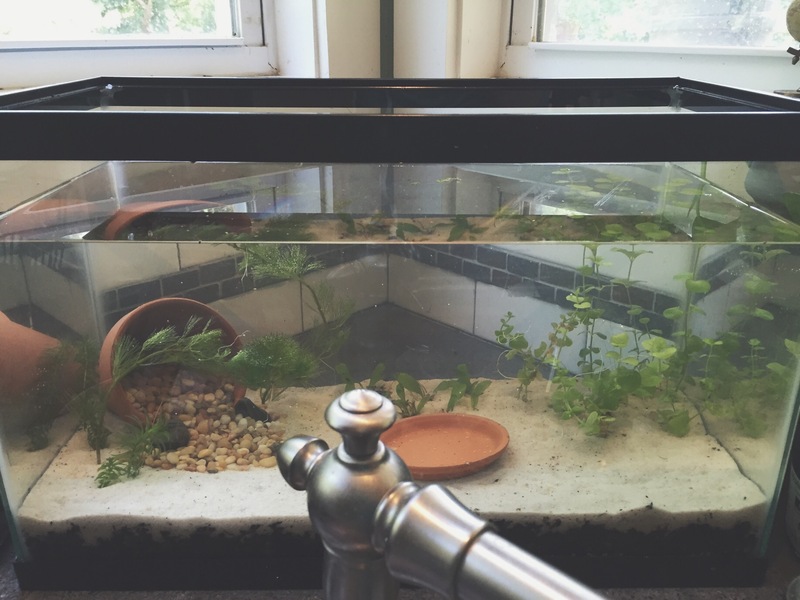 I re-planted a gallon bowl, and moved the aged water from the triops bowl in there. 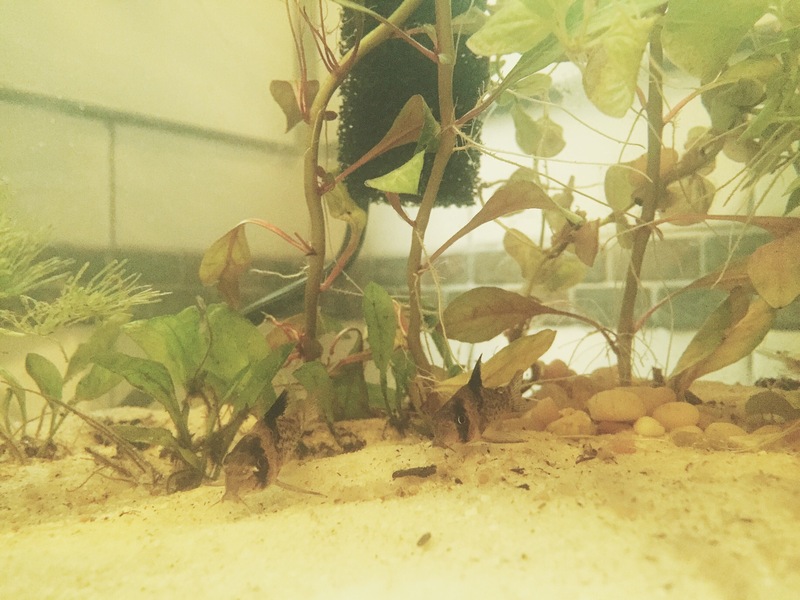 Planted it with creeping Jenny and cabomba that was floating in the triops bowl (the triops died at about 35-40 days old, which is about as long as they live). 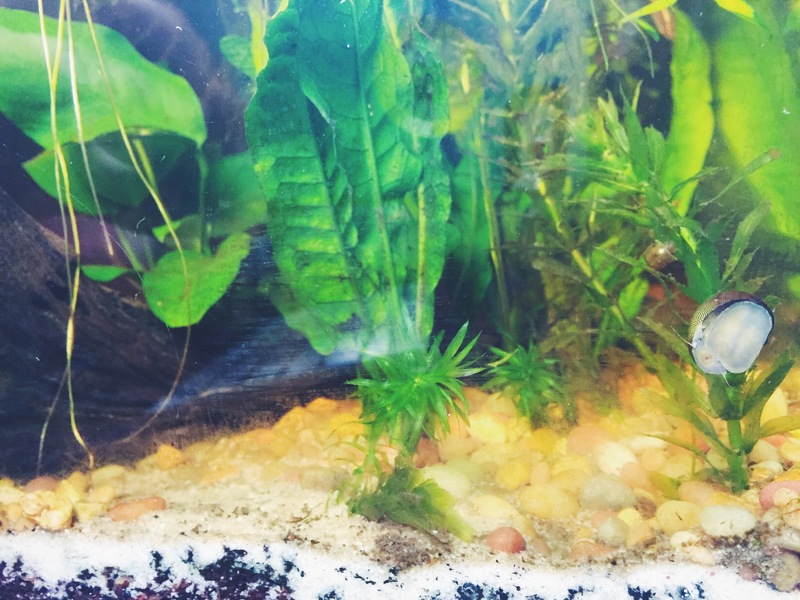 Let the pond snail that took up residence in the triops bowls stay because there appears to only be one of them. Then I moved the two ghosties in there as I’m guessing they are the reason there’s only two minnow fry, and I didn’t want them eating the remaining two. 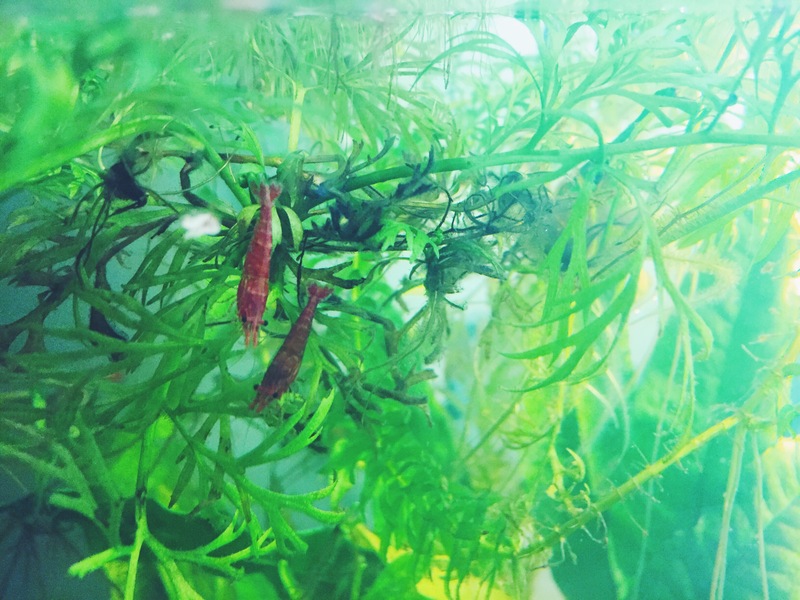 Researching red cherry shrimp, because I think they’d be a better match for the minnows while keeping the eco-system cycling. 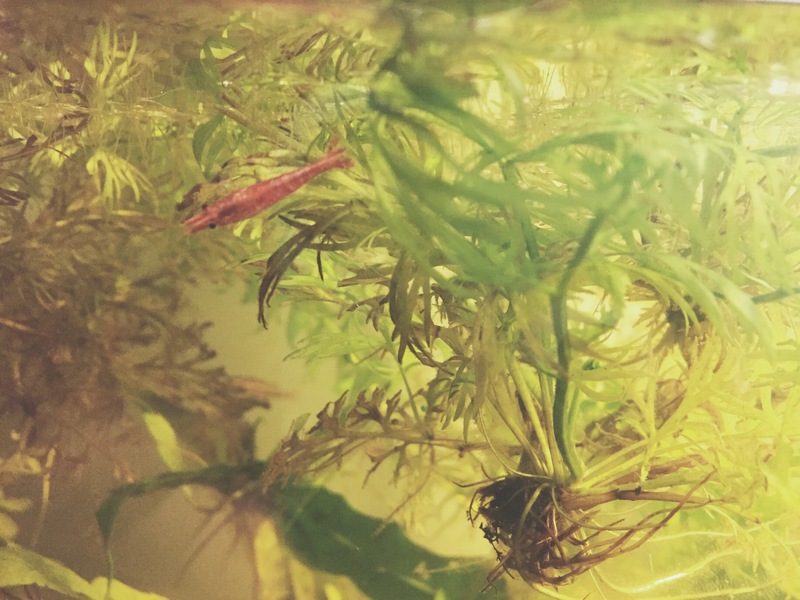 Reading Walstad’s book now so I’ll see if she has insight, but I’m pretty sure shrimp are essential to making the planted tank work at it’s most efficient. 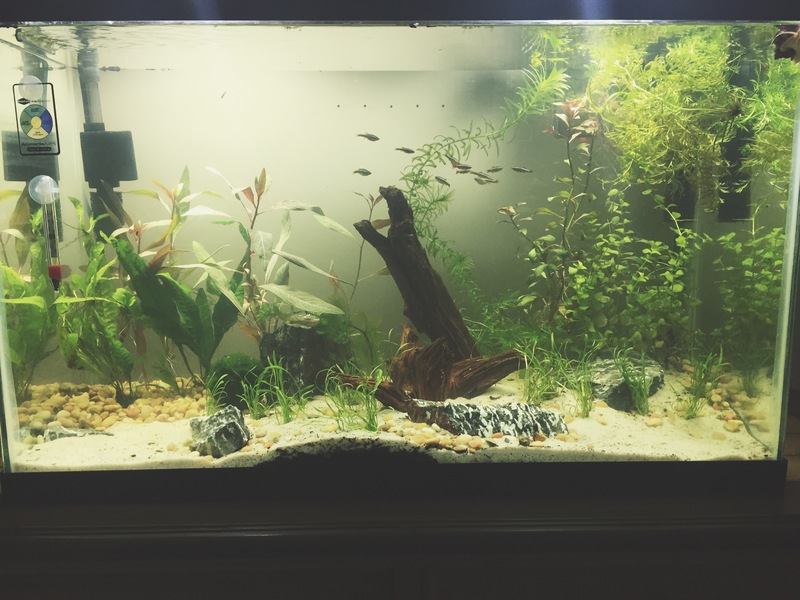 Author annaPosted on June 13, 2016 June 13, 2016 Categories Aquarium Plants, Ten Gallon Walstad, White Cloud Mountain MinnowsTags Fry, Low Tech Tank, Natural Planted Tank, Planted Tank, Walstad Method, White Cloud Mountain MinnowsLeave a comment on Minnow fry!